Noodles are a staple in my house. My girls love warm dishes and pastas served over whole wheat noodles. 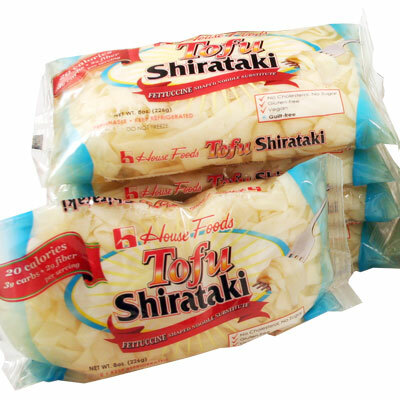 There are alternatives to even the whole wheat noodles that comes in the form of Japanese tofu Shirataki noodles. These noodles are low in calories and carbohydrates and are a healthy food ready to eat in 10-20 minutes. These delicious noodles are made from many different dried herbs and grains including black wheat, buckwheat, green tea or rice. You can serve Shirataki boiled or stir fried and you can top your noodles with spicy bean paste sauce, or in a cold or hot soup along with egg, vegetables, or different spices and sauces to create your very own special noodle. Common Ingredients: Filtered Water, Tofu (Soybeans, Calcium Sulfate, Glucono Delta Lactone), Yam Flour, Calcium Hydroxide. No Preservatives. 1.Bring 2 medium pots of water to a boil over high heat. In 1 pot, cook pasta according to package directions, then rinse with hot water to ensure pasta doesn’t get sticky when left to stand. (NOTE: If using regular noodles, use hot water as it washes away the starch better than cold water.) Fluff pasta with your fingers or a fork to further de-clump noodles, then set aside. In the second pot of boiling water, add broccoli, cover, turn heat down to low and simmer for 5 minutes. Drain and set aside. 2.Meanwhile, in a bowl, add coconut milk, tomato paste, peanut butter, ginger, garlic, pepper flakes and lime juice. Use a fork or whisk to thoroughly combine. 3.Simmer coconut mixture, bell pepper and bean sprouts in a nonstick pan over medium-low heat for 5 minutes, stirring often to prevent clumping. Add shrimp and cook for another 2 minutes, then flip shrimp over and continue to cook for a final minute. 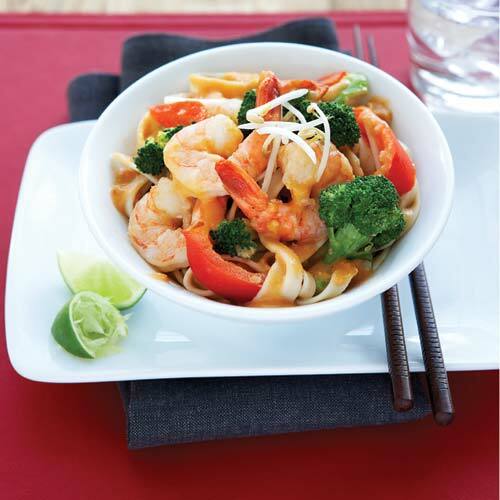 4.Toss noodles and broccoli with coconut-shrimp mixture and serve piping hot. Next Post Keeping it Clean and Budget Friendly!